The search for an optimal experimental model in pharmacology is recently focused on (mini)pigs as they seem not only to be an alternative source of cells and tissues for xenotherapy but also an alternative species for studies on drug metabolism in man due to similarities between (mini) pig and human drug metabolizing systems. The purpose of this work is to characterize minipig liver microsomal cytochromes P450 (CYPs) by comparing their N-terminal sequences with corresponding human orthologs. The microsomal CYPs exhibit similar activities to their human orthologous enzymes (CYP3A4, nifedipine oxidation; 2A6, coumarin 7-hydroxylation; 2D6, bufuralol 1'-hydroxylation; 2E1, p-nitrophenol hydroxylation; and 2C9, tolbutamide hydroxylation). Specific minipig CYP (2A, 2C and 3A) enzymes were partially purified and proteins identified by immunostaining (using antibodies against the respective human CYPs) were used for N-terminal amino acid sequencing. From comparisons, it can be concluded that the sequence of the first 20 amino acids at the N-terminus of minipig CYP2A is highly similar to human CYP2A6 (70% identity). The N-terminal sequence of CYP2C shared about 50% similarity with human 2C9. The results on the minipig liver microsomal CYP3A yielded identical data with those obtained for amino acid sequences of the pig CYP3A29 showing 60% identity with human CYP3A4. Thus, our results further support the view that minipigs may serve as model animals in pharmacological/toxicological studies with substrates of human CYP enzymes, namely, of the CYP3A and CYP2A forms. Cytochromes P450 (EC 1.14.14.1, CYP) enzymes are known to metabolize the majority of drugs, to detoxify environmental pollutants as well as to activate some classes of carcinogens as polycyclic aromatic hydrocarbons or nitrosamines [1–3]. Detoxifying systems of minipig and pig liver have recently attracted considerable attention [4–8] as the minipig and pig liver and hepatocytes are believed to be a possible solution for construction of bioartificial liver devices designed to overcome the shortage of human organs for transplantation [7, 9]. Moreover, pigs and especially minipigs might be good model species for general studies in pharmacology and toxicology without the need to induce biotransformation enzymes . Minipig and pig liver have been shown to express the main biotransformation enzymes in amounts and activities comparable to their human counterparts [4, 6–8, 11]. Three cDNA clones from a porcine small intestine cDNA library were identified as transcripts of three members of porcine CYP gene subfamily, CYP2D25, CYP3A29, and truncated CYP2C42; the fourth cDNA clone appeared to encode a putative CYP2C pseudogene [12, 13]. An advantage of the minipig is that it is apparently close to the conventional pig and, hence, the properties of the drug metabolizing systems should be very similar. 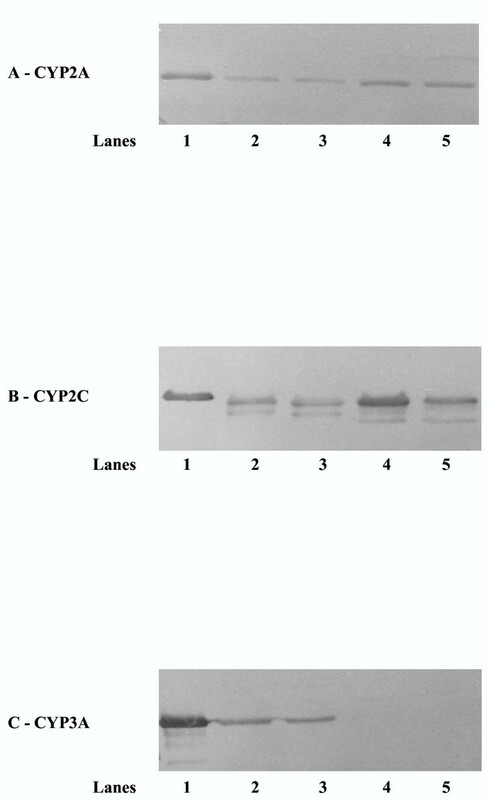 In our previous work, we have found CYP1A, 2A, 2C, 2D, 2E, and 3A marker activities in minipig liver microsomes by testing the respective specific substrates for human CYP enzymes . In this paper, we report the results of the isolation and characterisation of the first three CYP enzymes from minipig liver microsomal fraction belonging according to their activities as well as to their N-terminal amino acid residues to the CYP2A, CYP2C, and CYP3A subfamilies. The microsomal fraction of minipig liver homogenate has been shown to contain the activities characteristic of human CYP3A4 (nifedipine oxidation), 2A6 (coumarin 7-hydroxylation), 2D6 (bufuralol 1'-hydroxylation), 2E1 (p-nitrophenol hydroxylation), and 2C9 (tolbutamide hydroxylation) . The presence of these CYP enzymes in minipig microsomes was confirmed by immunoblotting using antibodies against the respective human P450 enzymes (results not shown). These results have confirmed our earlier finding  as well as the results of other authors on pig [6, 7, 14] and minipig liver microsomal systems [8, 15]. The isolation procedure led to fractions containing partially purified CYP enzymes in which the specific activities of CYP3A and 2A forms were detected, the activity of the CYP2C enzyme in the partially purified sample was not estimated as it has been consumed by experiments aimed at characterisation of selected proteins. The main purpose of this work was to obtain partially purified preparations, confirm the presence of selected CYP protein forms in them and with help of electrophoresis and immunoblotting to detect the corresponding CYP proteins. Subsequently, to use the identified CYP forms for N-terminal protein sequencing. Specific minipig CYP enzymes in the enriched fractions were visualised by immunostaining with cross-reacting polyclonal antibodies raised against particular human CYP enzymes (Fig. 1A,B,C). The bands on the blots stained for total protein by Coomassie Blue R-250 corresponding by their position to migration of purified human isoforms and yielding also the bands by immunostaining, in other words, identified this way to correspond to the respective human enzyme, were excised and subjected to N-terminal sequencing. This approach allowed identification of the first 20 amino acids from N-terminus of minipig CYP corresponding to human CYP2A6, 18 amino acids from N-terminus of minipig CYP corresponding to human CYP2C9, and 20 amino acids from N-terminus of minipig CYP corresponding to human CYP3A4. N-Terminal amino acid sequences or 5'-end cDNA sequences of pig or minipig CYP2A and CYP2C have not been published to date, therefore, we compared our results directly with the known human CYP2A6 and 2C9 sequences (Table 1). Immunoblotting of enriched samples of minipig CYPs Lane 1: 1 pmol of the respective CYP standard; lanes 2 and 3: CYP3A-rich fractions, 5 pmol; lanes 4 and 5: CYP2A- and 2C-rich fractions, 12.5 pmol applied per lane onto 8% gel. Blot development: A – 100 μg of anti 2A6 IgG; B – 50 μg of anti 2C9 IgG; C – 50 μg of anti 3A4 IgG. From this comparison it can be concluded that the N-terminus of minipig CYP2A is highly similar to human CYP2A6 (14 of 20 amino acids identical). Comparison of CYP2C family members may be quite difficult because of very high content of Leu at the N-terminus of the sequenced minipig protein (still about 50% sequence identity with the human counterpart, Table 1). Moreover, the human CYP2C subfamily has at least four highly homologous clones (sequence identity at the N-terminus > 90%), and therefore the existence of other CYP2C-related genes in the minipig may be anticipated. This problem may hamper further attempts to identify minipig CYP2C proteins with the approach we have used. cDNA cloning should help to answer this question much better. The protein sequence of another CYP protein present in the sample matched very well the N-terminal amino acid sequence deduced from published cDNA for pig CYP3A29 (Table 1, data from ). The pig/minipig CYP3A and human CYP3A4 shared about 60% sequence similarity (12 of 20 amino acids identical). The presence of a minipig liver CYP3A enzyme with similar activities to the human CYP3A4 has been reported earlier . Together with the data obtained with pig liver and intestinal microsomal systems [16–18], the results support the suitability of pigs/minipigs for modeling the biotransformation of drugs in man. From our results it seems that pigs and minipigs have CYP2A, 2C, and 3A liver microsomal enzymes with very similar N-terminal sequences to the human enzymes. This finding may be important for pharmacological and toxicological studies because i) CYP3A, 2C and 2A enzymes metabolize many known industrial chemicals and drugs in human use and ii) minipigs in pharmacology/toxicology are much easier to handle than conventional pigs as model animals. The observed high similarities of N-terminal sequences of minipig and human CYP2A and 2C confirm the previously published similarity in marker activities [4, 8]. The results presented in this study support the use of minipigs as experimental animals to predict biotransformation pathways in man and should stimulate further research on similarity of structure and substrate specificity of individual human and (mini)pig CYP enzymes. The conclusions then obtained may in future bring justification for the use of pig hepatocytes and liver for extracorporeal detoxification and xenotransplantation. All reagents and chromatographic materials were purchased from Sigma-Aldrich (Prague, CR) if not stated otherwise and were of the analytical grade purity. DEAE Sephacel was product of Pharmacia Biotech (Uppsala, Sweden). Polyclonal rabbit anti-CYP2A6, anti-CYP2C9, and anti-CYP3A4 IgG were prepared as described elsewhere . Human recombinant CYP2A6, 2C9, and 3A4 were expressed in Escherichia coli and purified as described previously [20–22] and used as standards. Microsomal fractions of liver homogenates were prepared from minipig livers (Brno white variety of Goettingen minipig, Research Institute of Veterinary Medicine, Brno, CR, 25–30 kg body weight, male castrates, N = 5, age 6 months). No induction protocols were applied to minipigs. The preparation of microsomes was done according to standard procedure . Separation of CYP enzymes from cholate-solubilized microsomal fraction was based in general on the procedure developed earlier [24, 25]. Solubilized microsomes were applied to an octyl-Sepharose column where the NADPH-cytochrome P450 reductase was eluted first during the wash with equilibration buffer (buffer A, 0.1 M K/PO4, pH 7.25, 1 mM EDTA, 20% (v/v) glycerol, 0.6% (w/v) cholate), in which the cholate concentration was reduced to 0.42%. A sharp peak containing cytochrome b5 together with CYP3A was eluted when the concentration of cholate was further lowered to 0.33% and 0.06% (w/v) Triton N-101 was added to buffer A. The next fractions eluted after CYP3A and cytochrome b5 appeared to contain mainly the CYP2C and CYP2D enzymes. Lastly, the fractions with CYP2A were eluted. CYP3A was separated from cytochrome b5 by anion exchange chromatography on DEAE Sephacel equilibrated with buffer B: 5 mM K/PO4, pH 7.7, containing 0.1 mM EDTA, 20% glycerol (v/v), and 0.2% sodium cholate (w/v). Increasing the cholate concentration to 0.5% along with addition of 0.2% Triton N-101 (w/v) resulted in elution of the CYP containing peak. Impure fractions containing CYP were dialyzed overnight against 10 mM potassium phosphate, pH 7.4, containing 0.05 mM EDTA, 0.1 mM dithiothreitol, and 20% glycerol (v/v) and further purified by chromatography on a hydroxylapatite column equilibrated with the same buffer. Extensive washing was done to remove Triton N-101. CYP was eluted using a linear gradient of phosphate, from 10 mM to 500 mM. The hydroxylapatite chromatography was repeated to further purify the CYP enzyme fractions prior to immunoblotting and amino acid sequencing. The results of activity assays are displayed in Table 2. Nifedipine oxidation was followed to characterize the CYP3A enzyme activity according to . Oxidation of nifedipine was determined in microsomes as well as in fractions after chromatography. In this case, a reconstituted system including 200 pmol of NADPH-cytochrome P450 reductase (PanVera, Madison, WI) was used with a procedure described previously . Coumarin 7-hydroxylation was followed to estimate the CYP2A activity . To monitor the activity of CYP2C enzyme(s), in microsomal faction, tolbutamide hydroxylation was determined . The determination of activities in fractions containing partially purified CYP enzymes was done in systems mimicking the original microsomal preparations with addition of components lost during the process of purification of CYP enzymes (NADPH:cytochrome P450 reductase, cytochrome b5, phospholipid). The method was based on general approach described by Shimada and Yamazaki . The nifedipine oxidase (CYP3A), coumarin 7-hydroxylation (CYP2A) and tolbutamide methyl-hydroxylation activities in microsomes and fractions containing partially purified CYP enzymes were determined as indicated in Materials and Methods, n.d., not determined. SDS electrophoresis was done in 10% and 8% (w/v) polyacrylamide gels by the method of Laemmli  using a MiniProtean apparatus (BioRad, Hercules, CA). Protein staining was done with Coomassie Blue R-250  and immunoblotting was performed as described  using the described conditions for development of blots . Polyclonal anti-human CYP2A6, 2C9 and 3A4 IgG were used. N-Terminal amino acid sequencing was performed using Procise Protein Sequencer (Applied Biosystems, Foster City, CA) and methodology based on Edman degradation. SDS electrophoresis, transfer of protein to Immobilon-P membrane (Millipore Corp. Bedford, MA), and staining methods are described elsewhere . Yields at each cycle were estimated by comparison with external standards. We thank E. Howard for technical assistance with the Edman degradation. The financial support from Grant Agency of the Czech Republic (grant 203/99/0277), Czech Ministry of Education, Youth and Sports (project MSM 151100003) and United States Public Health Service (grants R35 CA44353 and POI ES00267) is gratefully acknowledged.